My theme for 2017 is “More focus, more outdoors, less screen time”. 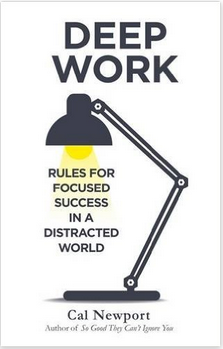 Keeping up with this theme, I picked up Cal Newport’s book “Deep Work”. What a fascinating read it was! It is certainly one of the best books I have read in recent times. Many of my questions and concerns on work culture, use of social media and embracing deep, meaningful work got answered through this book. To produce at your peak level, you need to work for extended periods with full concentration on a single task free from distraction. He then talks about how the “culture of connectivity” and “busyness as a proxy for productivity” are creating depth-destroying behaviors. The first part of this book is filled with precious insights that explain how shallow work can consume your entire day and work life, leaving you with feelings of dissatisfaction and lack of meaning and purpose. - Instead of adopting “any-benefit” thinking, use a craftsman approach to network tools selection. Does the use of a specific tool create substantial positive impact towards your professional/personal life? - Plan your leisure time. Don’t default to whatever catches your attention at that moment. This book needs time and attention to grab the finer details. So I wouldn’t advise a skim-through. I took the time to jot down key points that were relevant to me. I multi-task quite a bit, given the nature of my work. Upon reflection, I now realize how detrimental it has been to my productivity. I just can’t blame it on the work culture of today’s corporate environment and accept things the way they are. This book serves as a guide to get deep, meaningful work done amidst the cacophony of noise through endless communication and numerous things that demand your attention. I would highly recommend this book to all knowledge workers of today’s economy, especially those who are extremely busy during the day, processing emails, juggling meetings and random discussions, high-speed context switching etc and at the end of the day, wondering where the time vanished.